Autumn is without a doubt my favourite season in Sweden. Right now many Swedes are lamenting the end of summer holidays, missing the strawberries and midnight sun. Not I. I am basking in the fall colours, spotting rustling hedgehogs in the leaves and cooking up aromatic apples by the potful, stocking the freezer with homemade applesauce. But it isn’t just the turning colours, the waning sun or the sudden desire to wrap myself up in every scarf I own that leads me to love this season. It is the wild fare that makes my heart and taste buds swell. Sweden has a wonderful law called allemansrätt. Allemansrätt (pronounced more or less: all-uh-man’s-rat) is a series of laws that encourages people to get out into nature and enjoy the vast, largely uninhabited land that makes up Sweden. One part of allemansrätt is the right to forage. This means that anywhere in Sweden, except in farmers’ fields, gardens or behind locked gates, one can traipse off into the unknown and collect fruit, berries and mushrooms to their heart’s desire. And do I ever!! What can one find in a Swedish forest, you may ask? Isn’t Scandinavia a barren, frozen wasteland with nothing but vikings, frothing at the mouth? Well, yeah, sometimes. But usually that’s more during the winter months. In the autumn they just frolic in nature’s bounty. For me, this autumn bounty falls into three categories: apples, berries and mushrooms. In my (too many) years here I have learned how to find and identify a handful of edible Swedish species. Here we’ll have a look at some of the tasty (and not so tasty) mushroom specimens I found during last weekend’s forest excursion! 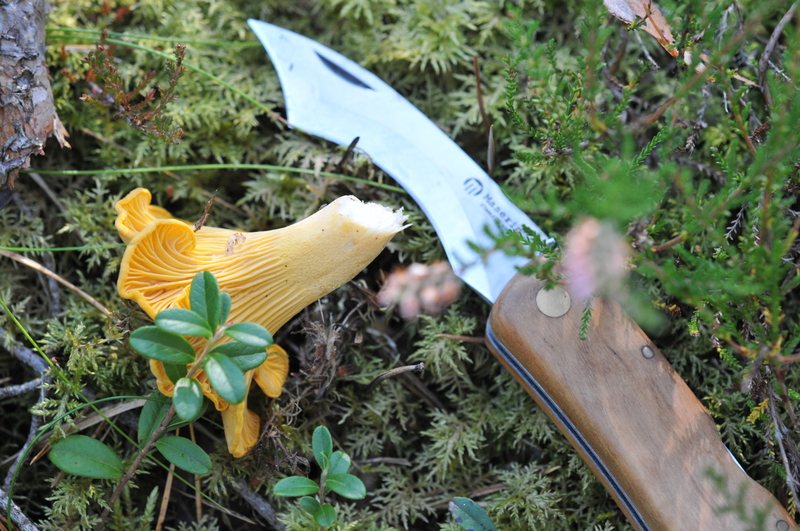 A mycologist (fungal biologist) I worked with taught me there are three types of mushrooms in Sweden: edible, not edible and ‘the Finns eat those’. I try to stick to the ‘edible’ category when collecting, but have been known to stray into ‘Finns eat those’ territory on occasion. But for today I’ll stick to the non-poisonous and truly yummy ones whenever possible. So – without further ado, let’s head to the forest! My first find of the day: three little wood hedgehogs! Of the fungal variety, not the less appetising – but actually surprisingly tasty – rodent-esque variety (yes, I have eaten hedgehog before.) These guys have a nutty, full taste and are often considered on par with the well-known chanterelle. Why are they called hedgehogs, one may ask? Well, flip them upside down and there are spikes, not gills! 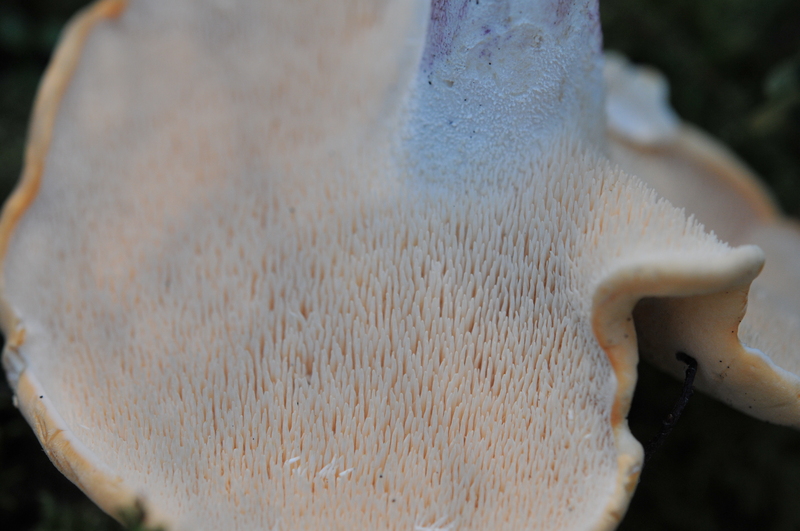 These ‘teeth,’ as they are called, serve the same purpose as gills do on other mushrooms by bearing spores. When I’m out collecting it is these teeth that make hedgehogs so easy to identify – if it has teeth and is white, it’s a hedgehog! No false IDs here! This one even the Finns don’t eat. 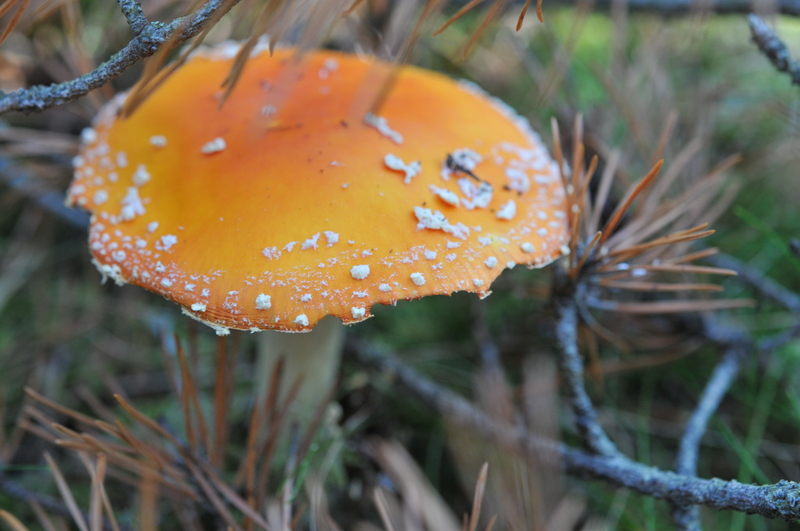 Amanita muscaria, also known as the fly agaric, is common in fairy tales. Sadly, these striking, be-speckled caps are as deadly as they are purported. Unsubstantiated lore also claims it is these caps that the vikings used to send themselves into ‘berserker rages.’ I would say this is doubtful at best, but a good story. Ugly? Yes. But this was the find of the day! The ‘horn of plenty,’ also known as a black chanterelle or (misleadingly) trompette de la mort in French, is one of the tastiest fungi in the forest – if you can manage to spot this camouflage queen among the debris! Some mushrooms are so ugly and larvae filled I wouldn’t even bother to ID them. Others are beautiful, but inedible, like this red-spored ‘surprise webcap’ – Cortinarius semisanguineus. However, it isn’t entirely without its uses – this species is one of several that can be used to produce a natural dye. 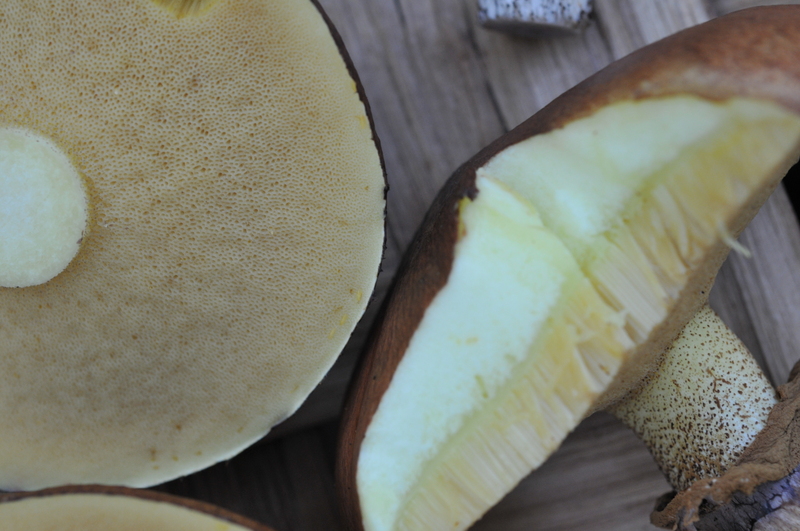 In fact, Mycopigments is a cool blog all about using mushrooms for dyeing! A pot of gold at the end of the trail! 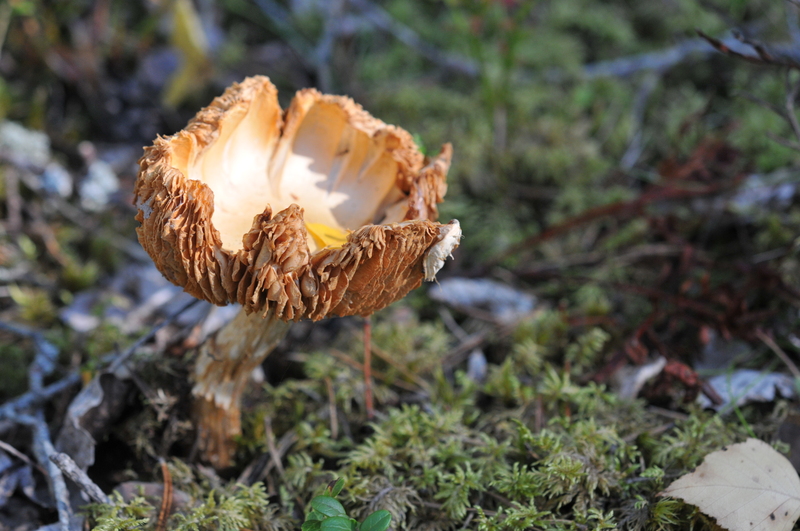 The golden chanterelle is one of the most sought after fungi. 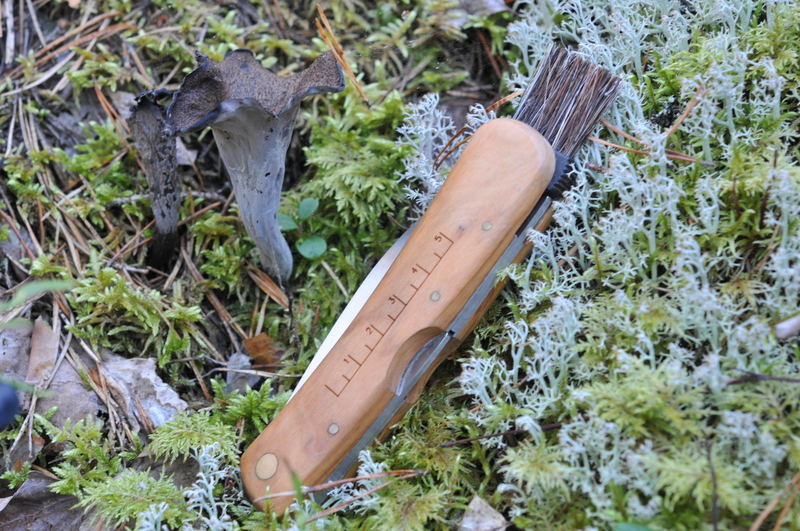 But good luck getting anyone to tell you where their chanterelle spot is – since these delicacies grow in a symbiotic relationship with certain tree species they will turn up in the same spot year after year. All in all not a bad day. A full basket of mushrooms, three containers of wild blueberries and lingonberries and a few apples to boot! Now, time for some mushroom drying, blueberry-vanilla jam making and applesauce indulging! Previous Post Area woman eaten by whale while hiking.